The ToughBuilt C700 Sawhorse and Jobsite Table is durable, rugged and offers unparalleled value. Constructed of 100% high-grade steel, this sawhorse has a remarkable 1300 lb. capacity alone, and 2600 lb. per pair. Transform 2 sawhorses into a solid jobsite table: features support arms that adjust to fit 2x4s or 4x4s. Its telescopic legs allow the sawhorse to work in any terrain. Also includes innovative material cutting & support pegs that allow for safe and easy cutting of materials. It also has easy-to-fold, steady feet for all-surface use. With a fast-open mechanism, setup is straightforward and simple. Powder-coated and zinc-plated steel prevents corrosion and withstands rigorous environments. This folding sawhorse includes an easy carry handle for effortless transport and rolled edges for safety and comfort. Convert your corded rotary tool into a light-duty, bench-mounted precision wood shaper with the Dremel 231 Shaper/Router Table. Featuring a smooth surface, our small router table makes it easy to slot, edge, groove and/or sand items in both conventional and irregular shapes. It also boasts simple-to-grip plastic knobs that include a screwdriver slot for easier tool assembly and depth adjustment. Add rustic flair to any room in your home with this mixed material console table. Display your accessories, dicor, or media components, even a flat screen TV. Crafted of powder coated metal and engineered wood. Perfect for your front entry, living room, bedroom, or even the kitchen . BRIGHTER, CLEARER, EASIER INSPECTIONS. The Milwaukee Penlight delivers 100 lumens of TRUEVIEW High Definition output. Illuminate more area with brighter, natural light for the truest colours and details. A protective rubber bite zone lets users safely direct light while performing two handed tasks. Waterproof and dustproof, this penlight is sealed to withstand the toughest jobsite conditions. The Penlight's 6000 series aircraft aluminum body and lens are impact and corrosion resistant. Use the penlight's metal clip to attach to any chest or pant pocket for quick, everyday use. The Milwaukee Penlight is covered by a limited lifetime warranty. C700 Sawhorse / Jobsite Table The ToughBuilt C700 Sawhorse and Jobsite Table is durable, rugged and offers unparalleled value. 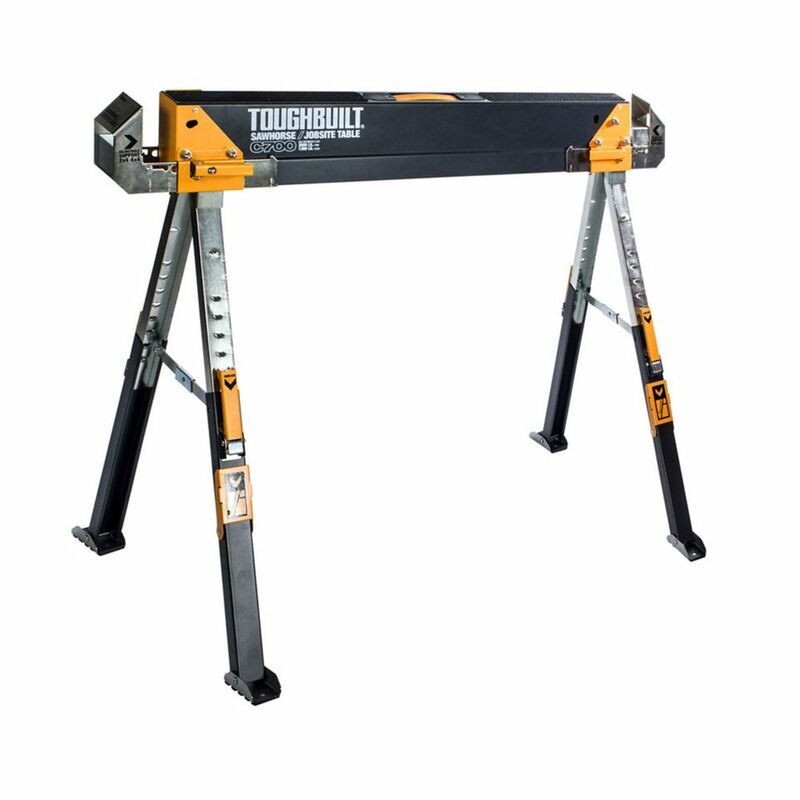 Constructed of 100% high-grade steel, this sawhorse has a remarkable 1300 lb. capacity alone, and 2600 lb. per pair. Transform 2 sawhorses into a solid jobsite table: features support arms that adjust to fit 2x4s or 4x4s. Its telescopic legs allow the sawhorse to work in any terrain. Also includes innovative material cutting & support pegs that allow for safe and easy cutting of materials. It also has easy-to-fold, steady feet for all-surface use. With a fast-open mechanism, setup is straightforward and simple. Powder-coated and zinc-plated steel prevents corrosion and withstands rigorous environments. This folding sawhorse includes an easy carry handle for effortless transport and rolled edges for safety and comfort. C700 Sawhorse / Jobsite Table is rated 4.7 out of 5 by 385. Rated 5 out of 5 by Sparky from Worked just as advertised. Very handy built in features not seen on others. Worked just as advertised. Very handy built in features not seen on others. Rated 5 out of 5 by Alex from they are very handy. like them a lot going to buy two more next week . they are very handy. like them a lot going to buy two more next week . Rated 5 out of 5 by AJ from Works as advertised.... Works as advertised. Rated 5 out of 5 by Eric from Excellent piece of equipment. Very portable and sturdy. The adjustable... Excellent piece of equipment. Very portable and sturdy. The adjustable legs and additional supports make these super flexible to use. These features were worth the extra $$ for me and Home Depot has the best pricing on these by far. Rated 5 out of 5 by Eric from For years I always bought cheap saw horses, but I decided to finally invest in some that are high... For years I always bought cheap saw horses, but I decided to finally invest in some that are high quality. I have to say that I am thoroughly pleased with them. The adjustable legs are nice, so far they have held a considerable amount of weight (approx 300lbs is what I had on them). How high are they at the tallest setting? Hello and thank you for your question, please note that the C700 saw horse has a open maximum height of 39.84 x21.46 x 25.00 Thank you.